Two ethical frameworks have dominated the discussion of organ donation for long: that of property rights and that of gift-giving. 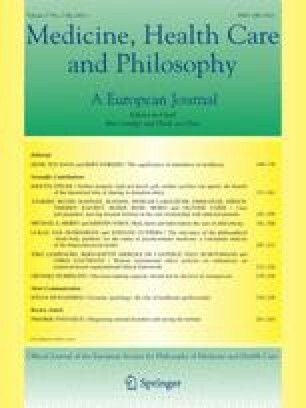 However, recent years have seen a drastic rise in the number of philosophical analyses of the meaning of giving and generosity, which has been mirrored in ethical debates on organ donation and in critical sociological, anthropological and ethnological work on the gift metaphor in this context. In order to capture the flourishing of this field, this article distinguishes between four frameworks for thinking about bodily exchanges in medicine: those of property rights, heroic gift-giving, sacrifice, and gift-giving as aporia. These frameworks represent four different ways of making sense of donation of organs as well as tissue, gametes and blood, draw on different conceptions of the relations between the self and the other, and bring out different ethical issues as core ones. The article presents these frameworks, argues that all of them run into difficulties when trying to make sense of reciprocity and relational interdependence in donation, and shows how the three gift-giving frameworks (of heroism, sacrifice and aporia) hang together in a critical discussion about what is at stake in organ donation. It also presents and argues in favour of an alternative intercorporeal framework of giving-through-sharing that more thoroughly explicates the gift metaphor in the context of donation, and offers tools for making sense of relational dimensions of live and post mortem donations. An erratum to this article can be found at http://dx.doi.org/10.1007/s11019-013-9525-x. The article is part of the research project Towards an Ethics of Bodily Giving and Sharing, funded by Riksbankens Jubileumsfond, Sweden, and written during my time as in-residence research fellow at the Swedish Collegium for Advanced Study, Uppsala University, Sweden. My thanks go to both of these. Zeiler, K. 2013a. Between bodies in dementia care: An intercorporeal conception of personhood—A philosophical defense of the idea that individuals can be held in personhood by others. Medicine, Health Care and Philosophy. doi: 10.1007/s11019-013-9515-z.